Barges, Canal Boats, Horse Boats, Hack Boats, Bye Trader, M Boats, B Boats, G Boats, E Boats, Guinness Barges, Guinness Boats, Sailing Barges, it's all very confusing. In the context of the Irish Waterways the following is a brief description of each of these work boats in simple layman’s terms. Barge: A general term for work boats, which were normally flat-bottomed cargo-carrying vessels. These could be motorised, sailing, horse drawn or towed by other vessels. B Boat: When the new numbering system came into operation around 1910 the letter “B” after a number was added to identify the boat as a Bye Trader or Hack Boat. A “B” boat could be either horse drawn or powered by an engine. Example of a B Boat: 112B. Bye Trader: See Hack Boat. 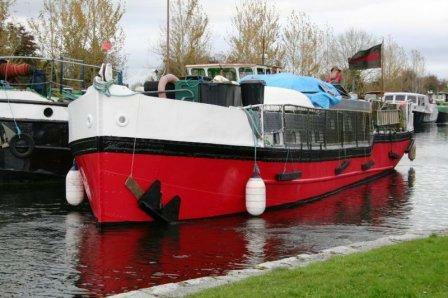 Canal Boat: The barges on the Southern Irish canals were called Canal Boats even though they operated on the river Shannon and the Barrow navigations. The canal men called any private pleasure boat “a Yacht”. The Grand Canal Company (GCC) who owned the canal had its own fleet of boats that were referred to as Company Boats. E Boat: Up to 1960 boats transferring to maintenance duties on the canals by the GCC or CIE were renumbered and had the letter “E” to identify them as Engineering Boats. That practice of renumbering apparently stopped with the closure of commercial traffic on the canal and after that a maintenance boat could have a letter E, M or B after its number. Example of an E Boat: 4E. G Boat: Were a small fleet of horse drawn boats built for the GCC during the WWII. These had steel fronts and backs and the remainder of the boat made out of native Irish timber. Some G Boats eventually went into private ownership and became B Boats. 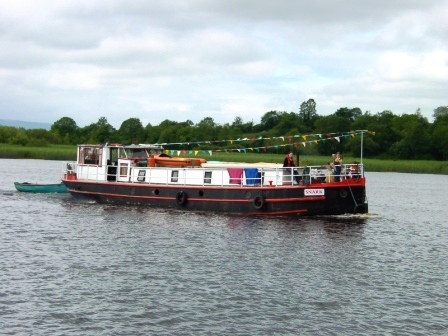 Guinness Barge: M Boats are very often incorrectly referred to as Guinness Barges. 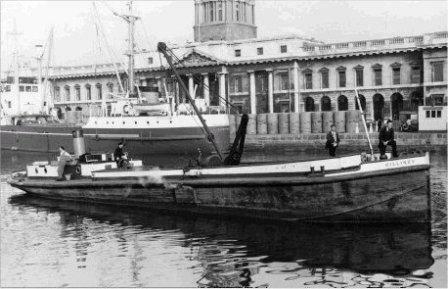 The reason for this is, particularly in the 1950s, Guinness was the main cargo carried on the Grand Canal and therefore identifiable with these boats. Guinness Boat: These were a fleet of boats that Guinness operated on the River Liffey bringing Guinness from St James Gate to the Dublin Docks. These boats were too big to operate on the canals. Hack Boat: Also referred to as Bye Trader’s. These were privately owned and operated cargo boats on the canal and could be operated by an individual (e.g. Peter O’Farrell) or a company (e.g. Ranks). Sometimes a bye trader leased a GCC M boat for a while and operated it as a Hack Boat, in these circumstances it seemed that the number of the boat didn’t change. Horse Boat: Initially the boats on the canals were horse drawn and made of wood, then iron and finally steel. In the early days these boats were numbered for identification and had no letter to identify company boats from private boats. Later on, with the introduction of a new numbering system, horse boats could have been numbered with a letter following such as B, E or G. There were horse boats on the Royal canal also and these just had a number. Example of a Horse Boat: No 2 Dabu. Lighter: The boats that worked on the waterways in Ulster, including the canals were called Lighters. The term was also used on tidal rivers such as the Suir and Barrow for unpowered boats that were moved by poles and oars. On Lough Neagh and elsewhere horse drawn lighters on reaching the lake could be transformed into a sailing barge. M Boat: When the GCC installed engines in their cargo fleet, they were re- numbered and given the letter “M” for Motorised. The first thirty M boats were converted horse boats; after that the company had a new fleet of boats built with engines. Example of an M Boat: 59M. 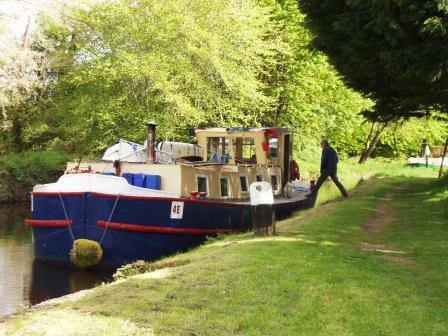 Narrow Boat: The term as used in England and Wales for the barges built to navigate their 7ft wide locks, along the system linking the south with the north, was not used in Ireland where most locks were at least 13ft wide. Boats used on the Ulster and Royal canals were narrower and boats used on the Bann were wider. Sailing Barge: On the bigger lakes and rivers there were cargo carrying, barges powered by sail. Example of a Sailing Barge: Sandlark. Tug Boat: Operated on rivers, on lakes, and on sections of the Grand and Royal Canals. These were barges which carried cargo and towed powered or unpowered barges or lighters. 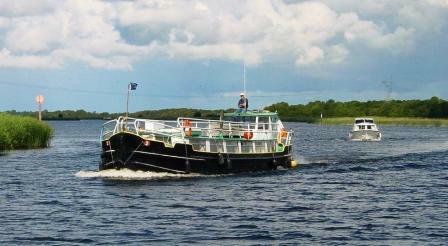 Example of a Tug Boat: Knocknagow.